Though the name of St. Guthlac is unknown to most Catholics today, Guthlac of Crowland was one of the most important Anglo-Saxon saints of middle England and enjoyed a widespread cultus throughout the Middle Ages. Guthlac is also unique among Saxon saints of the age in that his biography comes to us first-hand from a lifelong friend who knew him intimately - as opposed to sources removed by multiple generations, which is often the case with early medieval saints. Born in Mercia around 673, Guthlac was the son of an important Mercian nobleman called Penwald. We do know that he had at least one sister, Pega, who became an abbess and was also venerated as a saint. As the duties of the Anglo-Saxon nobleman was to fight at the beckon call of his lord, young Guthlac spent the formative years of his youth fighting in the wars of Aethelred of Mercia. Aethelred was a son of the dreaded pagan King Penda of Mercia, the king who defeated and murdered St. Oswald. Aethelred, however, was a pious Catholic, and though Guthlac spent eight or nine years as a warrior in Aethelred's armies he cultivated a very tender piety and had a reputation for gentleness. After his period of service was over, Guthlac felt great remorse for his war-mongering and entered the monastery at Repton. Repton was the most pretigious abbey of Mercia, allegedly founded by St. David of Wales around the year 600. Guthlac's arrival at the monastery is recorded in the monastic annals of Repton for the year 697, which stated that Guthlac wished to receive "the tonsure and religious dress, determined to do penance for his sins." He spent two years in the community of Repton before obtaining permission to remove himself to the wilderness to live as a hermit (c. 699). He chose for this area the fens of Crowland, a dank, marshy area in Lincolnshire on what was then a very large island. He took possession of the island on St. Bartholomew's Day(Aug 24, 699) and ever since St. Guthlac has been associated with St. Bartholomew. On Crowland he found an ancient Celtic barrow, which he dug out to serve as an oratory and cell. His penances were rigorous; he wore only animal skins and took only a little crust of bread and some water each day at sunset. While on Crowland St. Guthlac was attacked by demons (which, according to his biographer Felix, spoke Welsh. Guthlac, because he understood Welsh, was able to successfully drive them out). He also suffered from ague and marsh fever due to the unwholesome conditions of the fens. Nevertheless, his reputation for piety spread. He was once visited by Aethelbald, a prince of Mercia who was fleeing from his cousin King Ceolred. He stayed with Guthlac for some time and developed a tender affection for the saint, who would later favor Aethelbald with an apparition after his death. Like Francis in the 13th century, Guthlac earned the trust of the wildlife of Crowland; fishes and birds were among his friends. Pilgrims trekked across the fens of Crowland to seek graces and favors of the holy man, and Bishop Hedda of Dorchester elevated Guthlac to the priesthood so he could celebrate Mass in his humble oratory. St. Guthlac grew ill in 714 and received foreknowledge of his impending death. He passed away on April 11, 714. He had forewarned Ecburgh, Abbess of Repton, that he was dying and his sister Pega had been summoned to bury him. She arrived some time after his death and buried him in the mound at Crowland where he had passed fifteen years of his life in penance. One of the most famous stories concerning St. Guthlac happened immediately after his death. After he had died, he appeared in a vision to his old friend prince Aethelbald and predicted that the latter would shortly return from exile and become King of Mercia. Aethelbald was so pleased with this prophecy that he swore to build St. Guthlac an abbey if it came true. Aethelbald did in fact become king in 716. He kept his oath and dedicated the Abbey of Crowland in 716 on St. Bartholomew's Day in honor of Guthlac. Soon a large monastery arose, and through the industry of the monks who worked laboriously draining the marshes, the fens of Crowland became one of the richest spots in England. His sister St. Pega later returned to remove his relics to a nearby chapel, at which time he was found incorrupt. Several accounts of Guthlac's life exist. The first and most important is the Vita written by his friend Felix. Homily XXIII in the famous Vercelli Book (c. 975) is in honor of St. Guthlac, and two poems about Guthlac's life are found in the Exeter Book, the oldest surviving collection of Anglo-Saxon poetry. A collection of 13th century illustrations known as the 'Guthlac Roll' tells the story of the saint's death and is on display at Crowland Abbey. 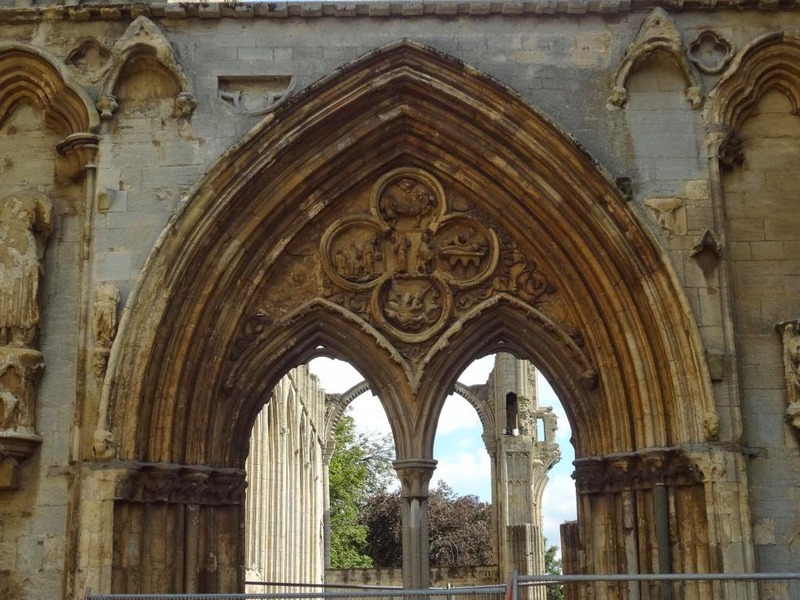 He is also frequently depicted in architecture of the Gothic period; above is a picture of a roundrel from the ruins of Crowland Abbey in Lincolnshire. Around the time of the Conquest, the Abbey commissioned another work on the life of St. Guthlac, which perpetuated his cultus into the Norman period and on until the Protestant Reformation. The Feast Day of St. Guthlac is April 11th. He is often depicted with St. Bartholomew, his patron, who gives him a scourge with which to do penance and defeat the demons. He is sometimes also shown standing atop a demon, who has been beaten into submission by Guthlac's prayers. For much more on the hermits of medieval England, we highly recommend Hermits and Anchorites of England by Rotha Mary Clay, available in the Unam Sanctam Catholicam store.